Damita— noble little lady in Spanish—is a bay black damsel with wonderfully dense fleece which makes up into absolutely gorgeous yarn. She typically produces over ten pounds of fabulous fibre annually! In her first show, she melted Judge Mike Safely's heart. He called her "teddy bear" and handed her the first-place ribbon. Damita is a conscientious mother, with lots of milk. Last August, she gave us Dalia (see the Dalia page) and was re-bred to the same stud. 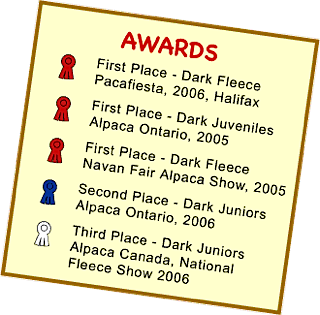 This August, we are hoping for another wonderful cria. Because of her stage of pregnancy, Damita did not be accompany us on the 2008 P.E.I. trip.